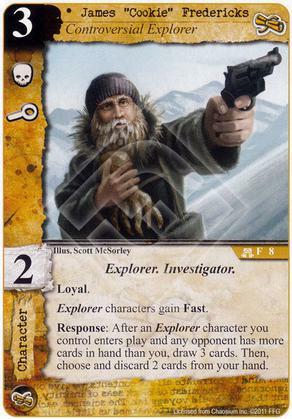 Explorer characters get +1 skill. 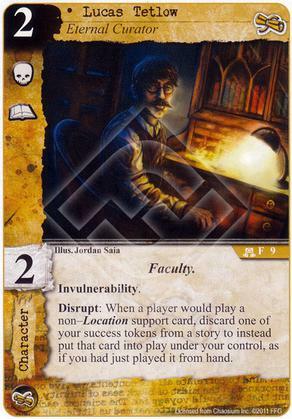 Response: After a character enters or leaves play from a card effect and you control a [Miskatonic University] card, put Matthew Alexander into play from your hand. 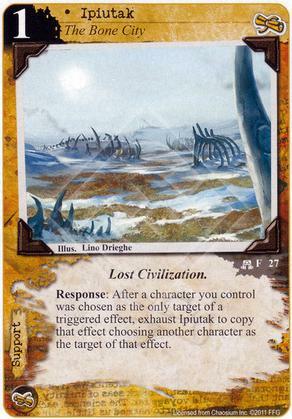 Response: After an Explorer character you control enters play and any opponent has more cards in hand than you, draw 3 cards. Then choose and discard 2 cards from your hand. 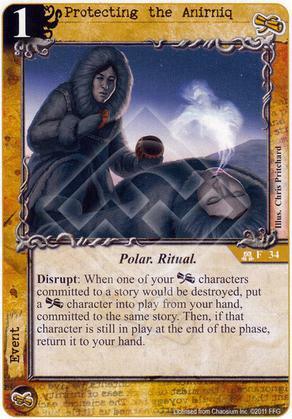 Disrupt: When a player would play a non-Location support card, discard one of your success tokens from a story to instead put that card into play under your control, as if you had just played it from hand. 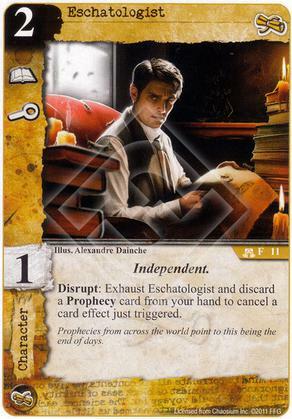 Disrupt: Exhaust Eschatologist and discard a Prophecy card from your hand to cancel a card effect just triggered. Prophecies from across the world point to this being the end of days. 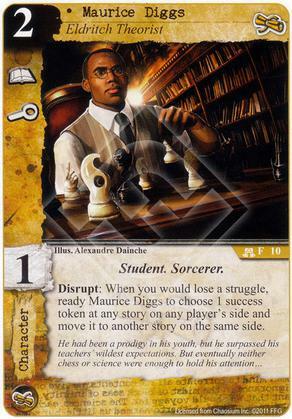 Disrupt: When you would lose a struggle, ready Maurice Diggs to choose 1 success token at any story on any player's side and move it to another story on the same side. 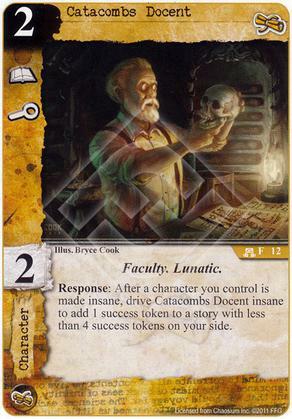 Response: After a character you control is made insane, drive Catacombs Docent insane to add 1 success token to a story with less than 4 success tokens on your side. 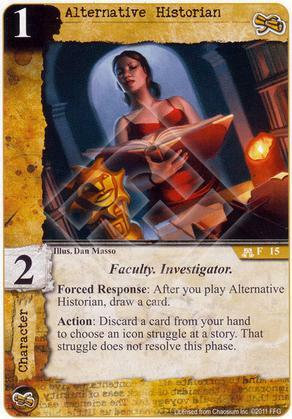 Forced Response: After you play Alternative Historian, draw a card. 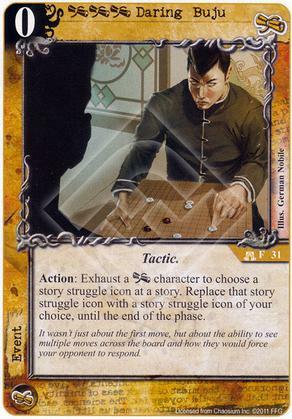 Action: Discard a card from your hand to choose an icon struggle at a story. That struggle does not resolve this phase. While Cub Reporter is committed to a story, if he is chosen to go insane because of [Terror] story struggle he does not do so until all other struggles at that story are resolved. "Do you still have no comment?" 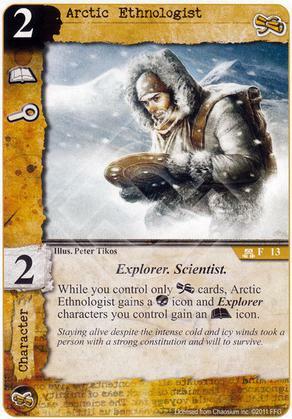 While you control only [Miskatonic University] cards, Arctic Ethnologist gains a [Combat] icon and Explorer characters you control gain an [Arcane] icon. Staying alive despite the intense cold and icy winds took a person with a strong constitution and will to survive. Disrupt: When a Student or Faculty character would be wounded because of a [Combat] struggle, instead wound Campus Security Guard. 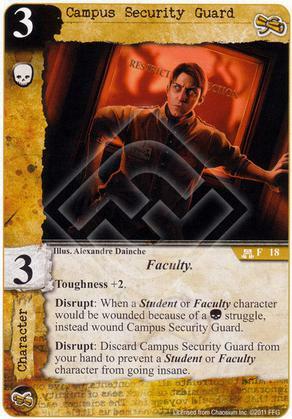 Disrupt: Discard Campus Security Guard from your hand to prevent a Student or Faculty character from going insane. 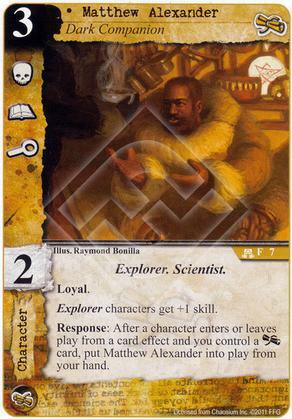 The cost of the first Research card you play each turn is reduced by 2 (to a minimum of 1). 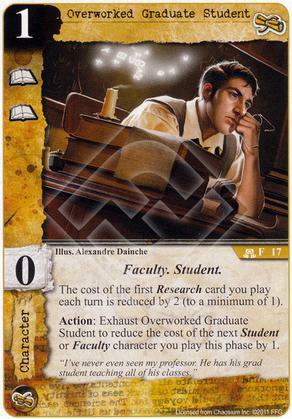 Action: Exhaust Overworked Graduate Student to reduce the cost of the next Student or Faculty character you play this phase by 1. "I've never even seen my professor. He has his grad student teaching all of his classes." Characters committed to this story lose all [Terror] icons. Few places were safe from their malevolent influence. 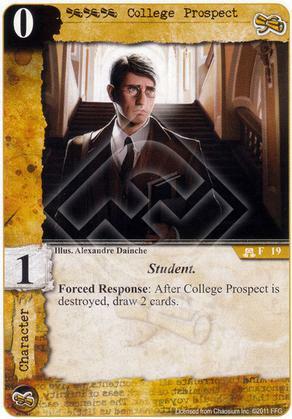 Forced Response: After College Prospect is destroyed, draw 2 cards. Attach to a Student character. Attached character gains Toughness +2. 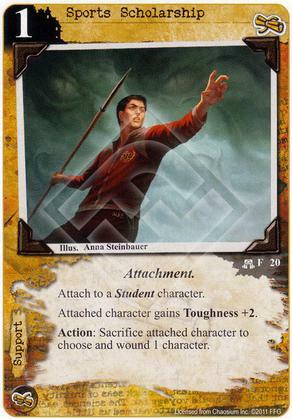 Action: Sacrifice attached character to choose and wound 1 character. Response: After you lose an icon struggle, exhaust Mu to restore 1 character or remove 1 wound token from 1 character. 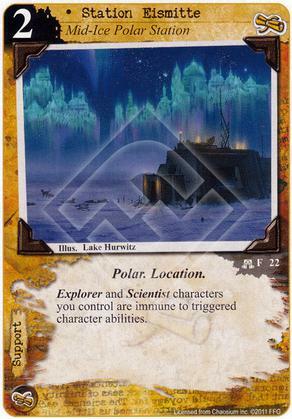 Explorer and Scientist characters you control are immune to triggered character abilities. 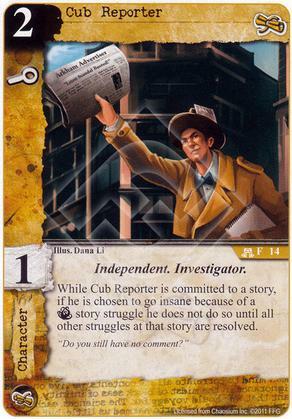 Response: After you win an [Investigation] struggle, pay 1 to search your deck for an event card or a Tome support card and add it to your hand. Then, shuffle your deck. Response: After a character you control was chosen as the only target of a triggered effect, exhaust Ipiutak to copy that effect choosing another character as the target of that effect. 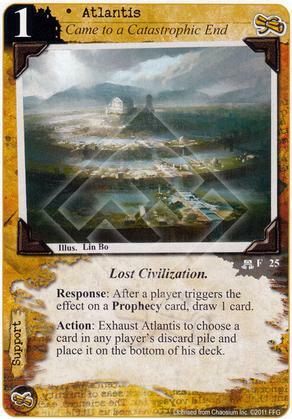 Response: After a player triggers the effect on a Prophecy card, draw 1 card. 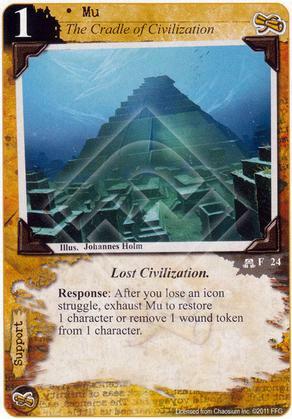 Action: Exhaust Atlantis to choose a card in any player's discard pile and place it on the bottom of his deck. 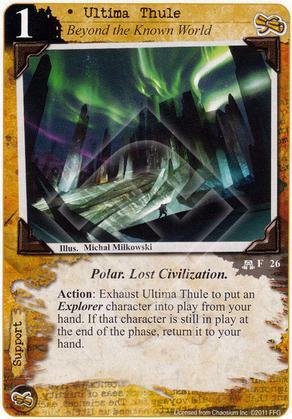 Action: Exhaust Ultima Thule to put an Explorer character into play from your hand. If that character is still in play at the end of the phase, return it to your hand. 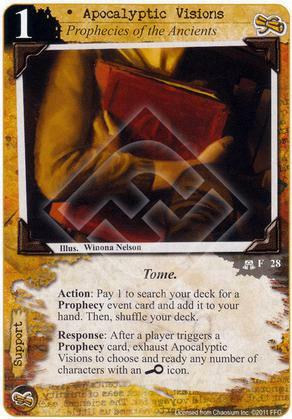 Action: Pay 1 to search your deck for a Prophecy event card and add it to your hand. Then, shuffle your deck. 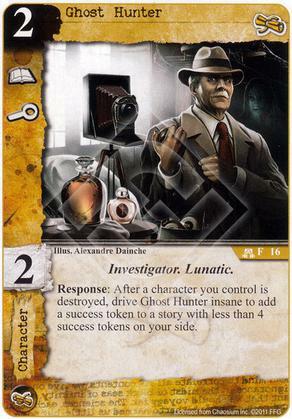 Response: After a player triggers a Prophecy card, exhaust Apocalyptic Visions to choose and ready any number of characters with an [Investigation] icon. Play during any player's draw phase. 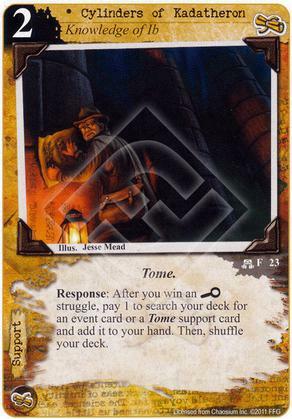 Action: Place this card face up on your deck. 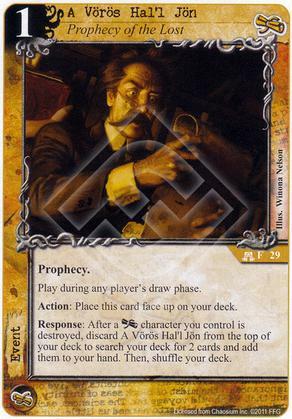 Response: After a [Miskatonic University] character you control is destroyed, discard A Voros Hal'l Jon from the top of your deck to search your deck for 2 cards and add them to your hand. Then, shuffle your deck. Play during the story phase before any characters are committed to stories. Action: Choose a story card. Story icon struggles do not resolve at that story this phase. Action: Choose a story and name an icon struggle. 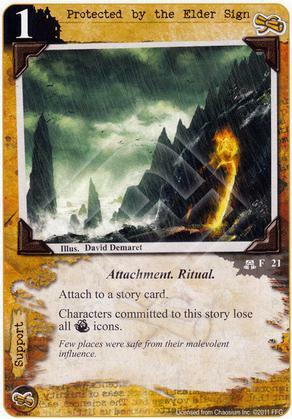 Only that icon struggle can resolve at that story this turn. 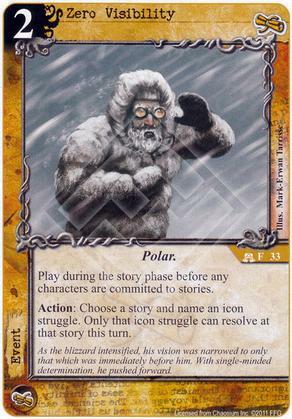 As the blizzard intensified, his vision was narrowed to only that which was immediately before him. With single-minded determination, he pushed forward. 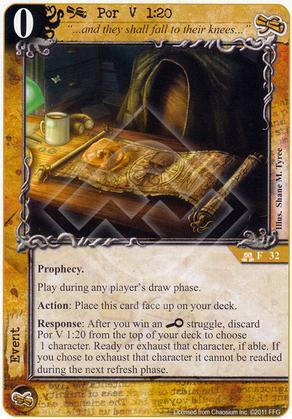 "...and they shall fall to their knees..."
Response: After you win an [Investigation] struggle, discard Por V 1:20 from the top of your deck to choose 1 character. Ready or exhaust that character, if able. If you chose to exhaust that character it cannot be readied during the next refresh phase. 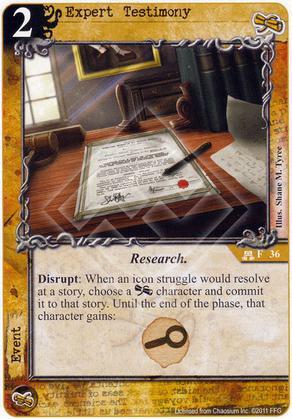 Action: Exhaust a [Miskatonic University] character to choose a story struggle icon at a story. 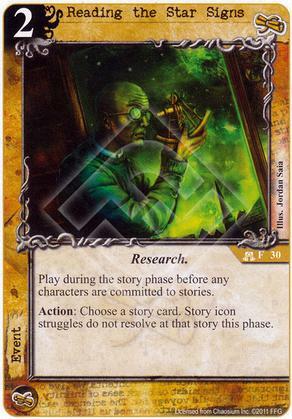 Replace that story struggle icon with a story struggle icon of your choice, until the end of the phase. It wasn't just about the first move, but about the ability to see multiple moves across the board and how they would force your opponent to respond. Disrupt: When a character you control would go insane or be wounded because of a story struggle, instead uncommit that character. Then, draw 1 card. 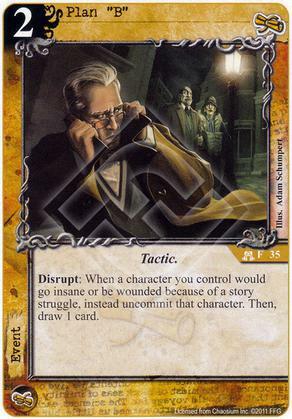 Disrupt: When one of your [Miskatonic University] characters committed to a story would be destroyed, put a [Miskatonic University] character into play from your hand, committed to the same story. Then, if that character is still in play at the end of the phase, return it to your hand.